Jamaican Blue Mountain is some of the most expensive coffee in the world – and some of the best, according to most tasters. It’s not all that common, but when you do come across it, it’s likely to be in a blend (unless you’re willing to pay a very premium price). The blends can be great, and they can also be a great deal. 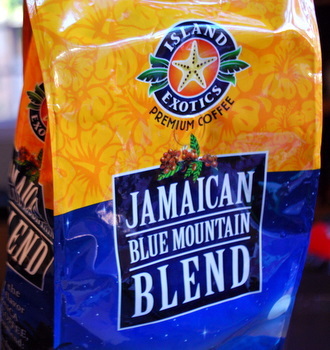 I picked up this bag of Island Exotics Jamaican Blue Mountain Blend at Cost Plus World Market on sale. This coffee states that it has a medium roast, and I found that I needed to use a little extra coffee when brewing to intensify the flavors. It has definite cocoa notes, and a hint of sweetness to it that provides a fairly balance overall flavor. There is a hint of bitterness in the aftertaste, but it comes along with a slight smokiness that tempers it and gives the coffee a relatively clean finish. I’m sure that it’s not going to stand up to a full Jamaican Blue Mountain coffee, but it’s a pretty nice everyday blend to drink in the morning.